A historically grand and rare Hermitage Blanc, whose last vintage was 1961. The Frey family brought back the tradition and made their first La Chapelle Blanc in 2006. 100% Marsanne from vines located in a section of the Hermitage called Maison Blanche (historically the greatest site for Marsanne in Hermitage). It is located at the very top of the hill where the soils are richer and deeper, which benefits the steady ripening of Marsanne, allowing it retain higher acid levels. 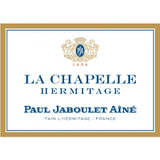 Coming all from the Maison Blanche lieu-dit and made from 100% Marsanne, the 2014 Hermitage la Chapelle Blanc is another fabulous white that shines for its purity, freshness, and focus more so than raw power and texture. Offering up classic Marsanne notes of buttered citrus, white flowers, quince and a kiss of lychee, this beauty hits the palate with full-bodied richness, solid mid-palate concentration and a crisp, beautifully defined texture and finish. It will be even better this time next year and have 15-20 years of longevity.